Home / Feature Slider / “Annie” clears away the cobwebs and sorrow. You can bet your bottom dollar that the famous red-headed orphan will delight children and adults alike. I generally steer clear of family musicals – my chair being repeatedly kicked or dialogue being drowned out by crying is not my idea of theatrical fun (it’s the same reason I eschew pantomime). But Annie, the story of the adventures of an 11-year old girl searching for the parents who left her at an orphanage in 1922, commands smiles and fuzzy feelings. 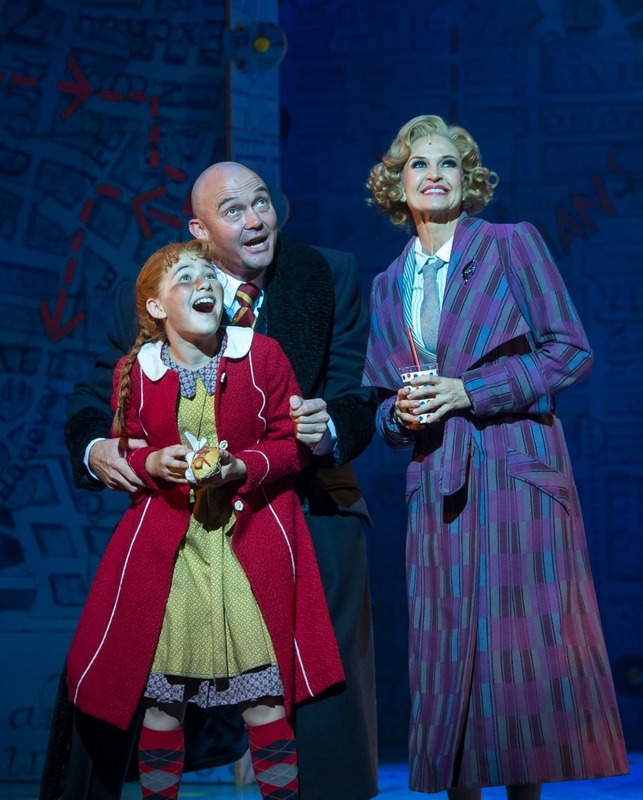 I read the novel, Annie (written by Thomas Meehan and based on the stage musical), dozens of times as a child and couldn’t pass up the chance to watch the show, now on at the Teatro at Monte Casino. Gutsy, optimistic Annie tries to run away from the New York orphanage that recalls Dickens’ Bleak House or Oliver Twist, presided over by the nightmarish Miss Hannigan, who makes the children sew instead of attending school. It’s 1933 and the Great Depression is far from over. Millions of people have lost their jobs and gathered to live in informal settlements called Hoovervilles (named after U.S. president Herbert Hoover under whose administration the Wall Street Crash happened). The little girl firmly believes her parents are out there somewhere, based on a note they left with her as a baby, saying they’d come back for her. They gave her half a silver locket so they could find her again, her only treasure. Annie’s escape is short-lived and she is brought back to the orphanage. Just as the little girl waits to hear what cruel punishment will be meted out, a young woman enters the orphanage. Grace Farrell, assistant to billionaire businessman, Oliver Warbucks, is looking for an orphan to spend the Christmas holidays with him. Standing behind Miss Hannigan, Annie signs that Grace should request an 11-year old girl with ginger hair. And so, Annie is taken to Warbucks’ mansion and treated to everything a child should have. Her indomitable attitude that “the sun will come out tomorrow” touches not only Warbucks, but also President Franklin D. Roosevelt. The all-South African cast is led by three actresses playing Annie. On opening night that was Emma-Rose Blacher, who beautifully captures Annie’s wide-eyed cheerfulness and confidence and sings a pitch-perfect “Tomorrow”. Three teams of child actors play the rest of the orphans, whose rendition of the popular “It’s the Hard Knock Life for Us” had the audience cheering and singing along. Charon Williams Ros, who was recently nominated for a Naledi for her role in Sweeney Todd, is roaring as the dastardly Miss Hannigan, with a great performance by Stephen Jubber as her cackling, scheming brother, Rooster. Neels Claasen is Daddy Warbucks, whose cut-throat business persona cracks under Annie’s spell. The most popular casting however, was that of Sandy the dog, portrayed by a real-life huggable Golden Retriever on stage. 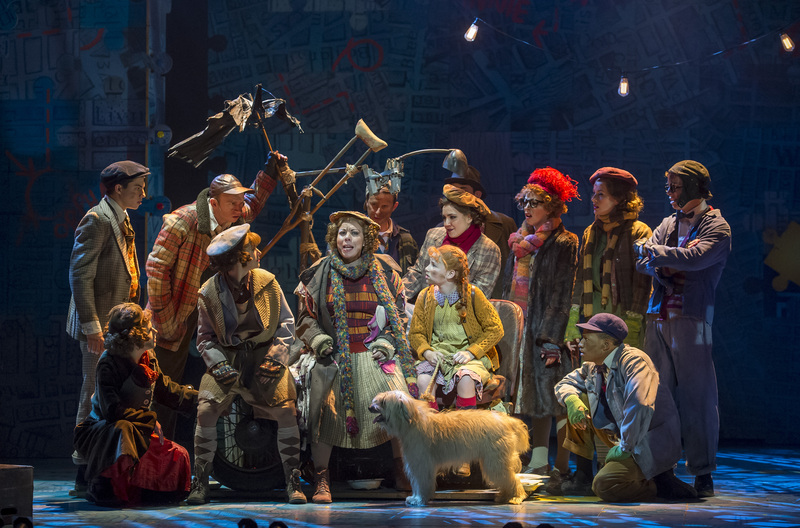 The set is smartly designed, capturing the gloomy orphanage, the depressing Hooverville, Mr Warbucks’ lavish mansion, Manhattan, and even the White House. The choreography is striking and matches the catchy tunes. 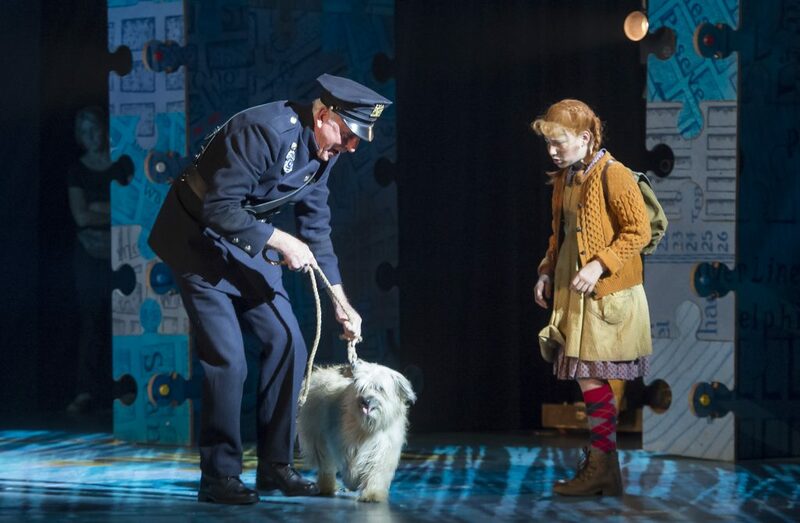 Although the story takes place nearly a hundred years ago, Annie is a tale that is universal and appeals to all. The struggles the orphans face haven’t changed much. Today, many children are still mistreated by foster parents meant to look after them and have no hope of finding loving homes. Annie’s message that “everything will be alright” is, although idealistic, one that resonates especially at times of uncertainty. Although the musical takes a lighter approach to the story than the book does, it does comment, albeit peripherally, on the Great Depression and the U.S. government’s ineptitude to deal with the problem. The show is on at the Teatro from 12 October 2016 to 27 November 2016 before moving to Cape Town’s Artscape from 02 December 2016 to 8 January 2017. This was not my rating for the review. It just captured a low rating and I can’t undo it. 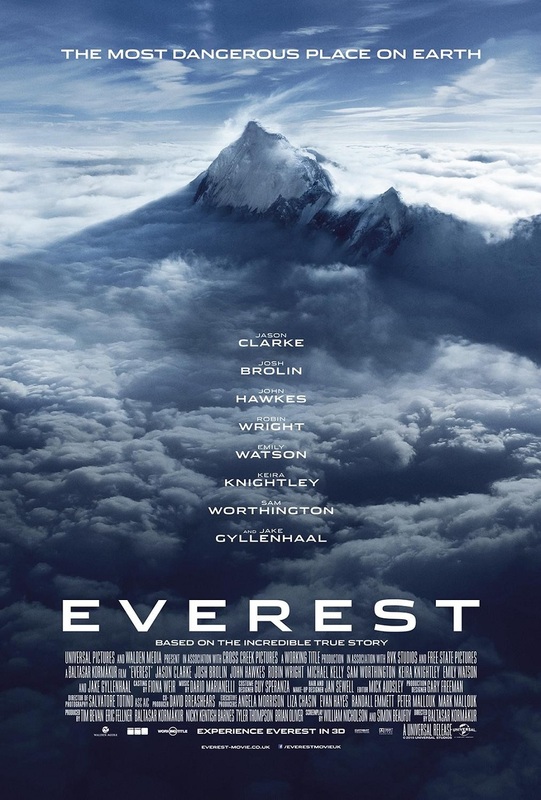 My rating is 4 out of 5. Andrea, you could not have read the book Annie by Thomas Meehan as a child. In musical theatre terms, the book means the script of the musica (ie the dialogue)l, which is what Thomas Meehan wrote. He based it on a famous comic strip, not a children’s book. For a long time I actually thought the novel came first and then the musical. I only discovered a few years ago that it was the other way around. I stand corrected. I had no idea there was a novel, but the show was not based on the novel. The original Broadway production opened at the Alvin Theatre on April 21, 1977 and the novel was published in 1979. Thomas Meehan therefore based the novel on the show, not vice versa. However I stand by what I said that in musical theatre terminology, “book by” wouldn’t mean the novel, it means the script of the show. I never said in the review that the musical is based on the novel, but I get what you’re saying about the word “book” in terms of the terminology for musical theatre, so I’ve amended “book” to read “novel” and then clarified that the novel is based on the show. Thanks for being such a keen reader and for picking it up! Thanks for taking the trouble to reply and amend. The show is close to my heart because I saw and loved the first production in South Africa on my 19th birthday in 1979. I am looking forward to seeing this new production when it comes to Cape Town. Previous: NEWS FLASH Bob Dylan wins the 2016 Nobel Prize for literature. Next: WIN! A hamper of seven top thrillers. “My Big Fat Greek Wedding 2” is as delightful as stale baklava. I didn’t want to like Russell Brand’s “Trew World Order” stand-up show. But I did.